After World War I, Heydrich joined a Freikorps, a paramilitary unit that fought Communists near his hometown. In 1922, he joined the German Navy and became a naval cadet at Kiel. On April 1, 1924, he was promoted to senior midshipman and sent to officer training at the Mürwik Naval College. Two years later, he advanced to the rank of ensign and was assigned as a signals officer on the battleship Schleswig-Holstein, the flagship of Germany’s North Sea Fleet. Admiral Erich Raeder dismissed Heydrich from the Navy in April 1931, after a charge of “conduct unbecoming to an officer and a gentleman,” for breaking an engagement promise to a woman he had known. Heydrich was devastated by the dismissal and the absence of prospects for a career. Six months later, he married Lina von Osten, a Nazi Party follower. The same year, Heydrich joined the SS and began establishing a counterintelligence division. Heinrich Himmler interviewed him and was so impressed that he appointed Heydrich to a position as chief of the new “Ic Service” (intelligence service). Heydrich set up office at the Brown House, the Nazi Party headquarters in Munich and created a network of spies and informers for intelligence-gathering purposes and to obtain information to be used as blackmail. Information on thousands of people was recorded on index cards and stored at the Brown House. In the summer of 1932, Himmler appointed Heydrich chief of the renamed security service – the Sicherheitsdienst (SD). Himmler named Heydrich to head the Gestapo on April 22, 1934. Two months later, the SD was declared the official Nazi intelligence service. In 1934, Heydrich assisted Himmler and Hitler in crushing the SA in the “Night of the Long Knives.” He helped organize Kristallnacht, a series of coordinated attacks against Jews throughout Nazi Germany and parts of Austria on November 9–10, 1938. On September 27, 1939, the SD and the Security Police (made up of the Gestapo and the Kripo) were subordinated into the new Reich Main Security Office or SS-Reichssicherheitshauptamt (RSHA), which was placed under Heydrich’s control. By late 1940, the Wehrmacht had swept through most of Western Europe, to include France, Belgium, the Netherlands, Denmark and Norway. The following year, Heydrich’s SD was given responsibility for carrying out the Nacht und Nebel (Night-and-Fog) decree. According to the decree, “persons endangering German security” were to be arrested in a completely discreet way: “under the cover of night and fog.” Thousands of people disappeared without a trace and no one was told of their whereabouts or their fate. Prior to the June 1941 invasion of the Soviet Union, Heydrich established four Einsatzgruppe, each with several Einsatzkommando, whose mission was to kill undesirable elements and potential partisans in Russia immediately after the German Army conquered the area. On September 27, 1941, Hitler appointed Heydrich as Deputy Reich Protector of the Protectorate of Bohemia and Moravia (the part of Czechoslovakia incorporated into the Reich in 1939), sending the actual Reich Protector, Konstantin von Neurath, on permanent leave, based on his soft approach to the Czechs. 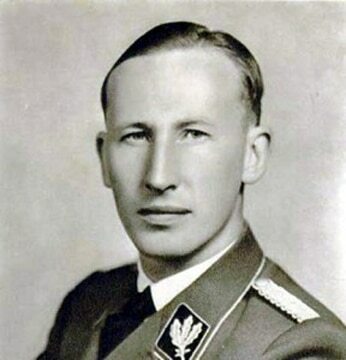 Upon his appointment, Heydrich told his aides that he would “Germanize the Czech vermin.” Heydrich, from his headquarters in Prague, enforced German policy, fought resistance to the Nazi regime and maintained production quotas of Czech military equipment and weapons, vital to the German war effort. Heydrich chaired the January 1942 Wannsee Conference, which laid out plans for the Final Solution to the Jewish Question, comprising the deportation and extermination of all Jews in German-occupied territory in Europe. A British-trained team of Czech and Slovak agents attacked Heydrich was in Prague on May 27, May 1942. The group had been sent by the Czechoslovak government-in-exile to kill him in an operation code named “Operation Anthropoid.” Himmler sent Dr. Karl Gebhardt to Prague to assist. Gebhardt disdained the use of sulfonamide, expecting Heydrich to make a full recovery without antibiotic use (which Gebhardt thought worthless). Heydrich died of sepsis a week later. When hearing of Heydrich’s death, SS-Obergruppenführer Sepp Dietrich proclaimed, “Thank God that sow’s gone to the butcher.” The Nazis retaliated for Heydrich’s death by linking the assassins to the village of Lidice, razing Lidice to the ground, executing all adult males and sending most of the women and children to concentration camps. Heydrich was buried in Berlin in an elaborate Nazi State funeral at the Invalidenfriedhof. Heydrich’s grave and remains were ransacked and destroyed after the war.